The small and private owned airport Oslo Torp, located some 120 kilometres south of Oslo, has attracted three of the top four low-cost airlines in Europe – Ryanair, Norwegian and Wizz Air – with success. The month of May saw a new record, with 183,832 passengers travelling to and from the airport, an all-time high for the month and up 12.2% on last year. Looking into the year to date, the growth is 10.6% and Torp is outpacing its bigger brother, Oslo Gardermoen, the largest airport in Norway, as its total passenger volume grew 3.7% (for the period January-April). The fact is that Torp is now the third largest airport in Norway by ranking of international passenger volume after Gardermoen and Bergen Flesland, both operated by state-owned Avinor. This is a remarkable achievement within a short period of time and confirms that an airport located off track from the most populated areas can be popular, both among airlines and passengers. In all fairness, Torp did also get a boost when Oslo Rygge airport was closed down in late 2016 and Ryanair moved a number of its routes from there to Torp. There’s no doubt about it, without the low-cost carriers Torp would only be an airport for flying clubs and flight schools, without any commercial aviation. 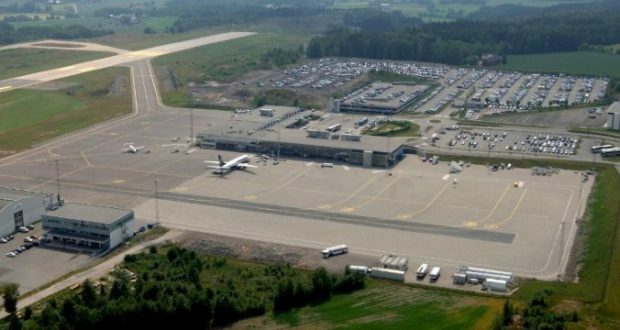 The operational costs for running an airport are very high and without a sufficient number of international passengers who spend money on parking, restaurants, shops and tax-free, there is no sustainability to own and run an airport of Torp’s size in Norway. Taking a glance at Avinor, the state-owned airport operator, around 60% of annual revenue comes from commercial activities, the remaining 40% being charges and fees paid by the airlines. Avinor operates 45 airports in Norway, of which 38 deliver a deficit each year, the total amounting to NOK 1.2 billion (€127 million), and it is not likely any of these 38 airports will deliver a surplus in the short or medium term, probably never. To finance the annual deficit, Norway has negotiated an agreement with the EU, called Single-Till, that allows Norway to subsidise these loss-making airports by allocating funds from the commercial revenues generated at Oslo Gardermoen. EU regulations on state-owned airports are very clear; all revenues from charges and fees paid by the airlines for operating into a state-owned airport must only be used to develop that airport only. Torp, on the other hand, being a privately owned airport, must be run in a sustainable way to stay in business, as there is no financial support coming from the Norwegian government. That’s why Torp must be attractive for low-cost airlines, as with total annual passenger volumes below one million, it will be tough times to keep the airport in operation. Attractive charges and fees for the low-cost carriers and charter and network airlines are the main tools Torp and similar airports use in their chase for more routes and growth in passenger volumes. As privately owned airports are not regulated by Avinor’s charges and fees, excluding air traffic control and governmental imposed taxes like the air passenger tax, they are free to negotiate charges and fees with the airlines. If the costs for an airline are attractive enough they will come, as they all know that Norway is a good market, but to grow the market only low fares and attractive destinations will do the job, as the passenger increase from Torp clearly demonstrates. It seems quite clear that being a privately owned airport in Norway is to some extent a risky business, not because it can lose some of the airlines flying to it but due to actions and regulations it cannot control. Norway is going environmental, led by the government, and most of the politicians in the parliament have a plan to make the country a beacon for the world in saving the environment by, among other measures, reducing emissions from aircraft engines. One of the tools was to implement an “environment tax”, later renamed to the Air Passenger Tax in 2016, to reduce the number of people travelling by plane within, to and from Norway. There was in 2016 already a CO2 tax on all domestic routes and in 2017 a new tax on CO2 equivalents was imposed on airlines flying domestically in Norway. During the second half of 2017, the parliament planned to rule that Vinmonopolet, the state-owned liquor and wine monopolist, would get involved with all tax-free stores at airports in Norway from 2022 when the present contract between Avinor and the tax-free company Heinemann ends. If the politicians also want to include the privately owned airports in this tax-free regulation, it may be a disaster for airports like Torp, as these airports are even more dependent on commercial revenues from tax-free and shopping than any Avinor airport. It can be the end of the story if the politicians do not differentiate between Avinor-operated airports and privately owned airports and decide to let Vinmonopolet operate and run tax-free at all airports on Norwegian soil.